The Silverfox Turmoil comes in a stylish blue and black design made with a steel hardtail frame. 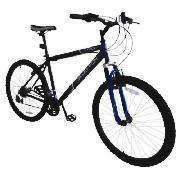 This bike features 21 speed Shimano gears and also has both front and rear V brakes. So nice he posted it twice. Amongst all the tesco bike deals I think this one is actually a decent bike for the money. Still a little on the heavy side (presumably because of the steel frame), but if I had to choose between this and the others posted, this'd be the one (within the price range). You're so cool you don't even say 'bike' - hero!